A Knife and Gun Crime Season on Channel 4...Monday 30th June, 2008. Channel 4 took an unflinching look at the increasing use of violence and weapons by young people on our Nation's Streets. A KNIFE & GUN CRIME Season on Channel 4, began on Monday 30th June, 2008. Channel 4 took an unflinching look at the increasing use of violence and weapons by young people on our Nation's Streets. Facing up to some uncomfortable truths about Knife and Gun crime, the season explores the effect of this disturbing trend on offenders, victims and society at large. STREET WEAPONS COMMISSION... giving evidence on the 13th May, 2008 in Birmingham Ann Oakes-Odger spoke on behalf of KnifeCrimes.Org to the panel of Commissioners headed by Cherie Booth QC. The Commissioners judged 'Westley's Weapons Awareness' as being 2 years ahead of the Government on Education...a Nationwide Education programme is now called for to Year 7's annual intake. The Commission investigated Gangs & Violent Crime by travelling to 5 major cities across the UK to speak to Police representatives, community workers, young people, doctors as well as Victims families. KnifeCrimes.Org...a snap-shot of the work in Schools, information delivered through Westley's Weapons Awareness Programme. 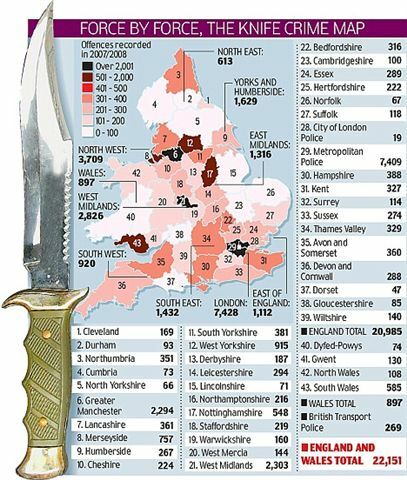 "We are appalled by the number of people killed through the use of Guns and Knives; we are further appalled that, although the number of people killed by knives is three times higher than those who are killed by guns, the legal system treats Knife Crimes less seriously than Gun Crimes. The Petitioner therefore request that the House of Commons urge the Home Secretary to introduce legislation so that the carrying of Knives and the use of Knives, and Sentencing Policies, are treated on the same terms as Gun Crimes". Ann Oakes-Odger's Campaign Success: Achieved Law Change and Education see 'Knife Petiton' page for full information. NOTE: Under 16's are not included in the above figures. FALLOUT by Roy Williams...Part of the 'Disarming Britain' Season - Channel 4's Season on Knife and Gun Crime screened at 10pm on Thursday 3rd July, 2008. Acclaimed actor and writer Lennie James, is one of the stars of Fallout, the TV version of Roy William's play about 'Teenage Violence'...has watched with horror as the death toll mounts. Lennie James here in an open letter to the 'Knife' carriers, he draws on his own difficult upbringing to make an impassioned please to the lost generation of young boys who visit random savagery on their victims. My name is Lennie James. I am a 42-year-old father of three. I grew up in South-West London. I was brought up by a single mother. I was orphaned at 10, lived in a kids' home until I was 15 and was then fostered. I tell you this not to claim any special knowledge of how you've grown, but to explaim how I have and from where I draw my understanding. When you're done with her, blame the man she picked to make you with. Blame him for being less than half the man he should have been. When he comes to bail you out and starts running you down for the terrible thin you've done, tell him straight: 'I did what I did coz you didn't do what you should have done.' Even if he did right; respected your mother, worked to provide for his family financially and spiritually, taught you right from wrong and drummed it home everyday... Even if he nurtured you as best he could, blame him for the generation of men he comes from. Damn them for letting you believe that respect is to be found with gun in hand or knife in pocket. Damn them and everyone who feeds the myth of these gangsters, villains, thieves and hustlers. Anyone who makes them heroes while damning hard-working educated, honest men as weak, sell-outs or pussies. The police stopped and seached us, but we fought that right our of their hands - we hoped into extinction. But they want to bring back that abusive practice. They are still hooked on punishment rather than prevention. They seem ignorant to the fact that they are feeding you acceptance of an already prevalent gang mentality. As far as you can see, the police are not protecting and serving you they are coming at you like just another street gang trying to boss your postcode. When I was where you are now, generation of state agencies, social services, policy-makers and politicians had not abdicated all responsibility for me. We weren't left to our own devices like you have been. Is it any wonder that you end up expressing yourself in such a violently pathetic way? We should be ashamed, I am. You have shamed us into a desparate need to do something about ourselves. We have collectively failed you and we should take all the blame that is ours for that...but, so should you. I blame you. I blame you because as a generation you are selfish, self-centred and have little or no empathy for anyone but yourselves. You are politically stunted and socially irresponsible and...you scare us. What scares us most is that you would rather die than learn. Your only salvation may be that still most of you aren't playing it out dirty. The vast majority of young men, even with all that is stacked against them, are finding their way around the crap. The boy you will kill, should you continue to carry that knife, almost certainly had the same collective failures testing him. He probably felt no less abandoned and no less scared. He also, almost certainly, wasn't carrying a knife. Whatever it seems like, whatever you've read, whatever you tell yourself about protection being your reason, statistics show the life you take will be that of an unarmed person. That is what that knife will do for you. It will make you escalate a situation to where it is needed. It will give you a misguided sense of confidence. It will make you the aggressor. That knife will make you use it. It will bring you nothing worth having. There is no respect there. The street may give you some passing recognition, but any name you think you might make will soon be forgotten. If you were mine, this is what I would tell you. I would make myself a big enough man to big. I'd get down on beded knees if I had to. I would beg you to take that knife out of your pocket and leave it at home. I would tell you that I know are are scared and lost and that I know the risks involved in what I'm asking you to do. I know that what we could step around, you have to walk through, and that there is always some fool who isn't going to make it any other way but the wrong way. I'm just begging you not to be that fool. Be a better man than that. Let the story they tell of you be that you exceeded expectations...that you didn't drown. Don't spend your days looking to be a 'bad-man'...try to be a good one. Our biggest failure is that our actions have left you not knowing how precious you are. We have left you unaware of your worth to us. You are precious to us. Give yourself a change to grow enough to understand whay.